SLAP! 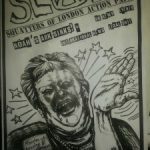 (Squatters of London Action Paper) is a monthly DIY newspaper for squatters in London. It is available in print and online as a PDF. 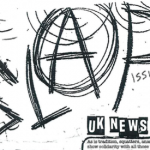 The paper combines news, pictures, analysis and humour and aims to strengthen connections between squatters in London in order to encourage direct actions and other forms of anarchist organising. Download here. The above info was taken from NFAAF. What a start to 2019 — some of the news that has kicked off the year has been so big it will already be familiar to many readers. The eviction of ADM for example. For 21 years the squatted docklands in Amsterdam were a place of pilgrimage for squatters and other weirdos all over the world. It’s a damn shame to see it go, the amount of creativity that came out of one space surely lends itself to the argument for free spaces. In response to this many actions were taken out across Europe, and a new squat was opened in Bristol in solidarity. 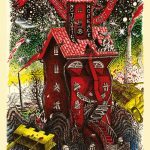 Even more recent was the eviction of Klinika in Prague which began approximately one week ago. Klinika was an autonomous space that for three years hosted a people’s kitchen, political discussions, and had a bar and ran alternative and music events. There’s a lot to discuss about both evictions, but I’d like to touch on some other updates before that. London: Check out that A.S.S. No comment – You might be able to explain your situation to the police, but in 99% of cases what you say to them will not get you out of the cells any faster, and can be used to incriminate you or any other people arrested. If you go to court it can all be used against you, especially if you are caught fibbing to the rozzers. Say NO COMMENT to any questions the police ask you and keep you and your crew safe. Have a bail address – someone who doesn’t mind telling the police that you stay with them sometimes and that you can possibly stay with for a bit if the police do put any bail conditions on you. You don’t want to give them an excuse to keep you in prison. Know a legal firm to call – don’t in any circumstances take the duty solicitor provided by the police. Remember the name of one of the solicitor firms on the bust card, available at all good anarchist soical centres and refuse t have an interview until your lawyers are called. Good luck out there! Feed the pigeons! Temporary Autonomous Arts was in May determined to return to its roots as a squatted exhibition. A decrepit long term empty in Bow was transformed into a blank canvas by the TAA mob, who then were boosted after 24 hours notice after a rapid-response possession order requested them to attend High Court in Birmingham. Undeterred, a second building was snatched in North Woolwich and repurposed against the clock. The TAA opened as planned on the Wednesday to a splatter of spoken word,followed up by a blinding cabaret gig featuring public urination, wild drag anarchy from Jizmik Hunt and the body-positive monarchy-bashing of Glittasphxia. arguing that the TAA crew made a tactical decision in a tight spot. 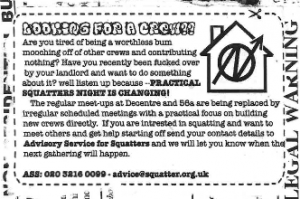 Heads-up for the long-awaited Issue 5 of your friendly, local squatters’ paper. SLAP! is a squatter’s freesheet first printed in early 2016. After a quick half-year of squat-hopping, sitting around and organising elsewhere, some of us involved in the previous four issues teamed up with others and knocked-together a fifth. SLAP! is back to support the flow of counter-info between London squats and act as a semi-regular message-board for squat happenings, updates and unapologetic ideas.